Our application has bitcode enabled, so we can't use dSYM files generated on our machines/CI but rather we should use dSYM generated during bitcode compilation. The problem here is that we don't have those files available to download on App Store Connect (no link is presented). That's really weird. We suspected that maybe our 3rd party tool which we upgraded recently and that is used to obfuscate our binaries started to work incorrectly but all builds get "Validated" status and we can publish them in App Store without any issue. 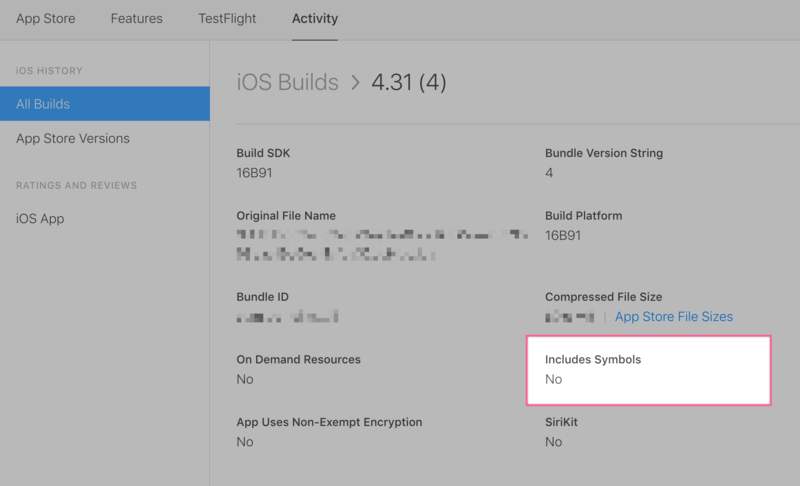 I suppose that bitcode process runs correctly as we get smaller binaries available in App Store, but dSYM is somehow not produced. I found a thread on Apple Developer Forums but nothing really uncovers the root of this issue: DSYMs No Longer Offered for Download? Browse other questions tagged ios itunesconnect bitcode dsym appstoreconnect or ask your own question. Is bitcode required in order to allow users to download only the executable architecture needed for the target device?